in the city of Shoosh . and to return the company to public ownership . 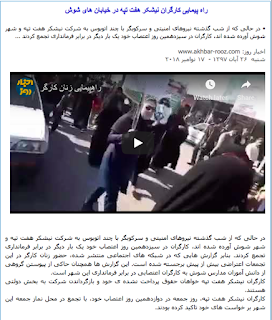 (Beirut, November 22, 2018) – Iranian authorities have increased targeting of teachers and labor activists in recent weeks for organizing and conducting peaceful protests, Human Rights Watch said today. 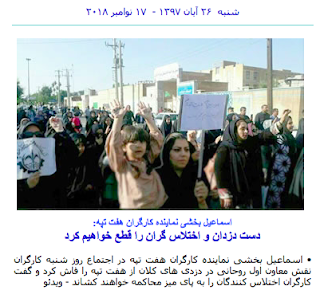 Iran’s recent crackdown on labor activists has extended to the private sector. On November 18, the Telegram channel of the Haft Tappeh Sugar Cane Workers' Syndicate reported that authorities arrested all members of the association of labor representatives for the Haft Tappeh Sugar Cane company, including two of the group’s prominent leaders, Esmael Bakhshi and Mohsen Armand. 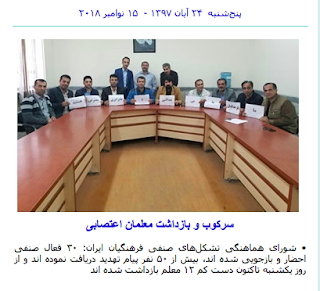 On November 20, Mosfata Nazari, the prosecutor of Shoosh County, told reporters that authorities have released 15 labor activistswho were arrested during the protests. 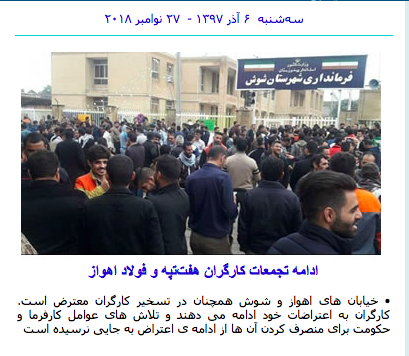 Despite of many load of security forces by regime in the city , the workers gathered in front of Governors building for protest. Reports indicates that , many women and students have joined the workers to protest . The workers demanded their unpaid salaries to be paid and also to return the ownership of the factory from private ownership to public . 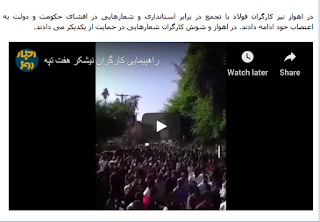 In the city of Ahwaz also the workers at Foulad Steel Company protested in front of the Governors building and in a joint action with " Haft Tapeh ..." workers they also demanded for their rights . 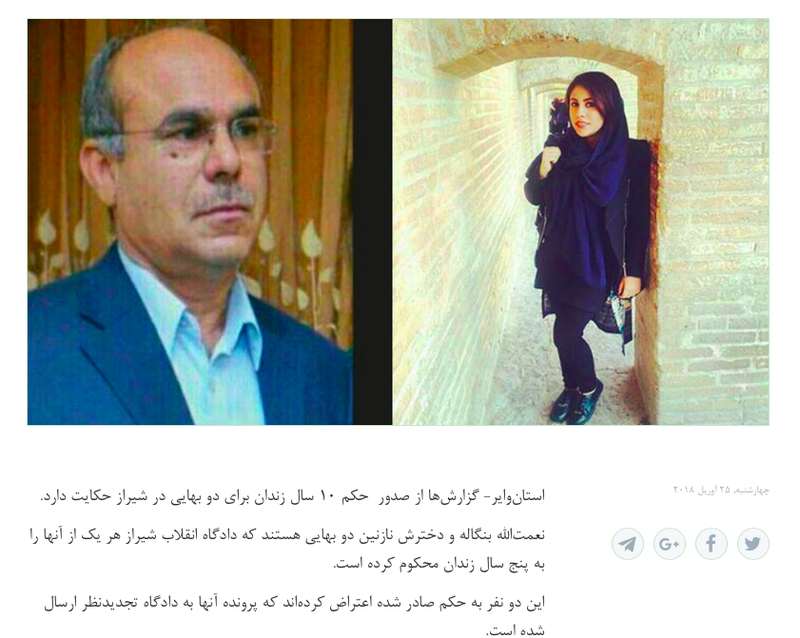 Mr. Nematollah Bengaleh and his daughter Nazanin both from the city of Shiraz each one received five years prison sentences by Shiraz city court of revolution. Both have protested to the sentencing and the case went to appeal court. 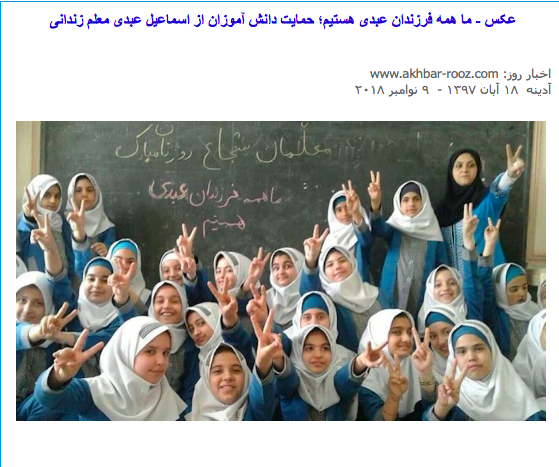 This is happening while Mr. Zarif regimes Foreign Minister says : " Being Bahai in Iran is not a crime " . Both Mr. Bengaleh and his daughter were arrested earlier and their house were searched and they both were released on bail. My husband developed bone cancer and need immediate treatment but the authorities won't do anything for his treatment . Arash Sadeghi the imprisoned husband of Golrokh Iraei has developed bone cancer and need immediate release from prison and treatment in a hospital . IRAN WATCH CANADA : Is there ears to listen? 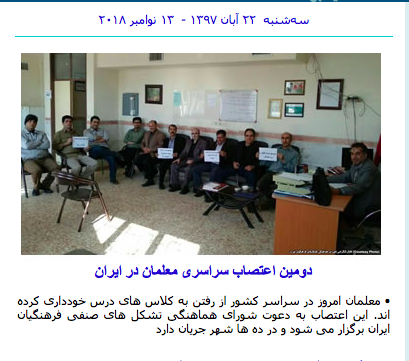 Teachers in all over Iran started their strike from today . The strike is organized by Iran teachers council. The teachers will go to school but won't attend in classes. 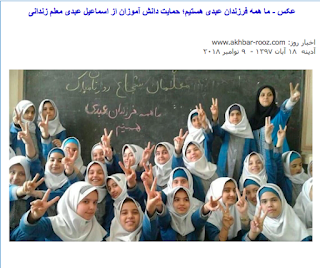 immediately release the imprisoned teachers . Stop privatization of school . Free education for all students . Iranian authorities must immediately disclose the fate and whereabouts of hundreds of members of the Ahwazi Arab ethnic minority being held without access to their families or lawyers, Amnesty International said following reports that some have been executed in secret. In the last few days, Ahwazi Arab activists outside Iran have told Amnesty International that 22 men, including civil society activist Mohammad Momeni Timas, have been killed in secret. Since 24 September, up to 600 Ahwazi Arabs have been detained incommunicado in a wave of arrestsfollowing a deadly armed attack that took place in Ahvaz, Khuzestan province, two days earlier. “If confirmed, the secret executions of these men would be not only a crime under international law but also an abhorrent violation of their right to life and a complete mockery of justice, even by the shocking standards of Iran’s judicial system,” said Philip Luther, Amnesty International’s Research and Advocacy Director for the Middle East and North Africa. One of those reported to have been secretly executed is Ahmad Heydari, a 30-year-old ceramics shopkeeper who was arrested within a few days of the armed attack in Ahvaz. His family heard no news of his fate or whereabouts until 11 November, when they received a telephone call summoning them to the information centre of the Ministry of Intelligence in Ahvaz. There, they were given his death certificate and told he had been executed on 8 November. 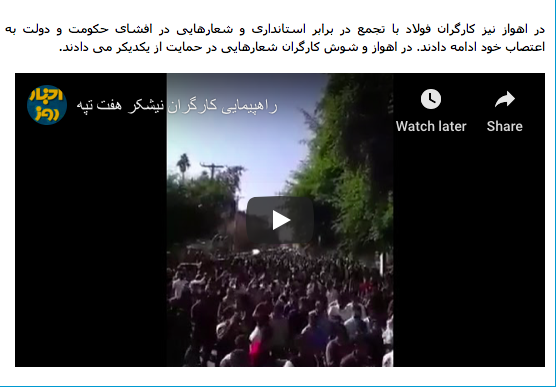 By contrast, the governor of Khuzestan province told the state-run Islamic Republic News Agency on 12 November that reports of 22 detainees being executed are “complete lies”. He also said that those arrested in connection with the Ahvaz attack have been charged, but gave no indication that any of them had been brought to trial. “In the absence of any information about the whereabouts of the detainees feared killed, the governor’s blanket denial will provide little comfort to families who have been unable to see or hear from their relatives since their arrests,” said Philip Luther. Amnesty International calls on the Iranian authorities to reveal the whereabouts of all the detainees without further delay and provide information about what legal procedures have taken place to date. The authorities must give the families and their lawyers access to the detainees and ensure they are protected from torture and other ill-treatment. Amnesty International is also calling on the authorities to release immediately and unconditionally any Ahwazi Arabs held solely for peacefully exercising their right to freedom of expression, association or peaceful assembly or solely on account of their ethnic identity. “While the Iranian authorities have a duty to bring to justice anyone suspected of criminal responsibility for the attack in Ahvaz in fair trials, they must not use this as an excuse to carry out a purge against members of Iran’s persecuted Ahwazi Arab ethnic minority,” said Philip Luther.